The first thing you need to know about household odors is that you’re probably the worst judge of whether or not you’ve got them. That’s because the human body has a self-protective mechanism that quickly desensitizes your nose to lingering odors. So, if you suspect stinky house syndrome, start by asking a trusted friend to perform a sniff test immediately upon entering your home. Open your windows! Just a few minutes of fresh, clean air works wonders for dissipating and displacing airborne odor-causing molecules—all the better if it’s a windy day. Clean regularly. Regular and thorough home cleaning is, hands down, the most effective and ultimately greenest means of removing odor sources from your home. The reason: When you clean frequently, you can use mild, environmentally friendly solutions and still be effective at preventing big odors from developing. But, when you allow odor-causing agents to dig into surfaces and textiles, you need much stronger, harsher chemicals to address the unpleasant smells that result. Deep clean if it’s been a while. If you’ve been less-than-dedicated to regular house cleaning for some time, deep-cleaning might be necessary to address well-established odor sources before regular cleaning can be truly effective. Key odor-producing areas on which to focus include: toilet tanks, drains, refrigerators/freezers, trash receptacles, recycling bins, garbage disposals, oven spills, washing machine (sanitize), mattresses, heavy bed linens, curtains, carpets, furniture upholstery, and your dishwasher’s food grinder and filter. Use your science. Baking soda (which is alkaline) works well as a so-called ‘green’ deodorizer because it bonds chemically to neutralize acid-based odor-causing agents. The reverse may be true for acidic substances such as white vinegar or used coffee grounds, which are also often recommended as ‘green’ odor removers. The key takeaway here is that you need to know the basic chemistry or biology of an odor you’re attacking in order to determine what substance will be effective at eliminating it. 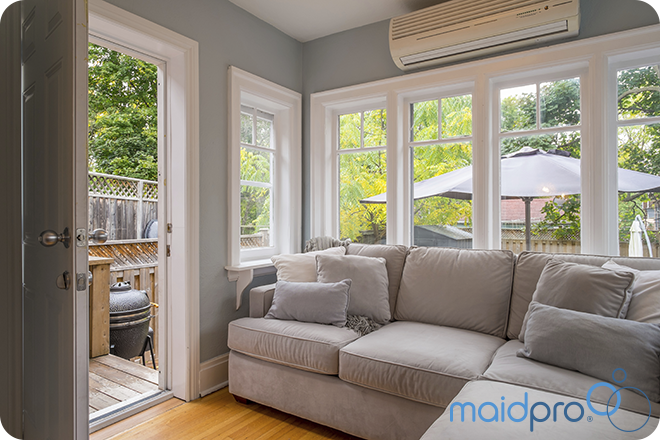 For serious odor sources such as black mold or pet urine, it’s best to call seasoned pros (like MaidPro’s PROs) who know how to remove both effectively and safely. Once you’re done eliminating all the sources of foul odors in your home, try these DIY projects to make your home smell amazing! Go gradually. Acknowledge that your body needs time to re-learn how to stand comfortably for long periods. Start with a small daily goal and build from there. Check your posture. To avoid muscle and joint pain, cultivate a correct standing work posture, which is probably very different from how you’ve been sitting. If you struggle with this, seek the advice of an orthopedic specialist, chiropractor, physical trainer, or certified yoga instructor. Invest in equipment that enables you to stand and work comfortably. Purchase or request an adjustable/standing desk and a balancing type of chair. Less stable than regular chairs, balancing chairs force you to keep core muscles engaged, both strengthening your core and burning off calories and blood sugar to boot. If not in control of the office budget, ask for the right equipment anyway! The worst that can happen is your request will be denied. Look for any opportunities to stand and move more throughout your day. Walk around when taking calls. Drink lots of water and use the least conveniently located restroom. Park far away from your office or cubicle. Choose stairs over elevators. Get your computer reassigned to a printer at the far end of the building. Walk for at least half of every lunch hour and on breaks. Evaluate all the tasks you do each day; reserve sitting for only ones requiring the greatest concentration. You will be amazed at how many medium and low-concentration tasks you can complete more effectively and energetically while standing and moving. Preach! Think about it. If you can get enough coworkers onboard, entire meetings might be conducted either standing or walking, which is certain to make them shorter and more productive. Be prepared with examples and evidence to support what you’re doing and willing to evangelize a bit to bring others around to your way of thinking. Be patient with yourself. Keep reminding yourself that, even when you don’t feel 100% in control of your work situation, there are always opportunities to make choices and to take micro-actions that support your own good health and well-being! 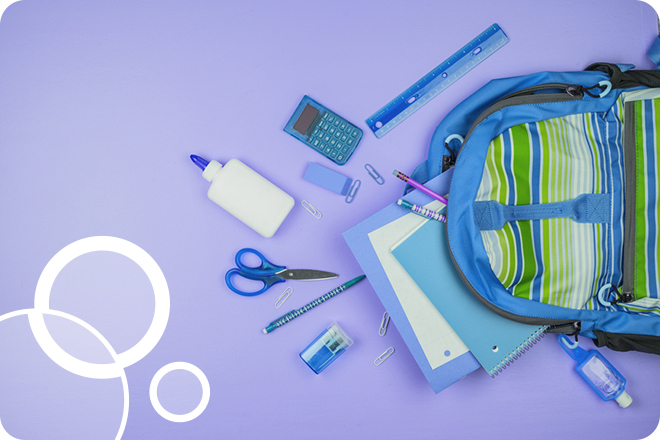 Last year around this time, we offered six tips to Get Organized for Back to School. This year, we’re highlighting five simple home projects that are guaranteed to make your family’s school-day routines flow better, faster, and with much less parental stress. Make space. Clear out and donate old clothes, sporting equipment, outerwear, and so forth. When you do thisbefore school and fall sports really get rolling, it helps your kids to more easily and independently assess their wardrobe options, decide what to wear, and find what they need under the duress of morning rush. Dirty clothes are also more likely to end up in the laundry, and having sufficient space for clothes smooths laundry workflow overall—yes, things can actually be routinely cleaned, folded, and put away! Purge and deep-clean the kitchen. When you’re done with closets and drawers move on to your kitchen, inspecting and tossing expired foods and deep-cleaning your fridge, freezer, and cabinets. This will give you space to stock up on nutritious, energizing snacks and fast, easy-to-prepare weeknight meals. Make several weekday menu plans. Waiting until ‘day of’ to decide what’s for dinner is a recipe for overspending on food, increasing food spoilage and waste, adding to daily mental stress, and falling into food and nutrition ruts. Plan out a few weeks’ worth of rotating weeknight menus and shopping lists to keep things interesting, nutritious, and cost and time efficient. Take inventory. As you are freeing up space in your home—and before hitting those big back-to-school sales—make an inventory of what you already have and exactly what you need in terms of clothing, athletic gear, school supplies, snack foods, and so forth. This enables you to shop with precision, saving time and avoiding impulse buys. Make an easy checklist system for kids to manage on their own. A story went viral recently about a school principal in Arkansas who is turning away parents seeking to drop off forgotten items such as lunches and lunch money, gym clothes, and homework. The principal’s goal is to encourage kids to problem-solve on their own. But, some kids are just naturally disorganized. Even if you don’t have a chronic forgetter on your hands, try hanging a dry erase or similar board by your exit door. Encourage your kids to create their own daily checklists and take responsibility for collecting what they need before leaving the house. This has a triple benefit of relieving your personal mental workload, avoiding SOS calls and trips to school to deliver forgotten items, and teaching your kids skills that serve for a lifetime. Select a charity that picks up. To motivate yourself, go ahead and schedule a pickup date, being sure to allow time for laundering and dry cleaning of donations as needed. Plan to sort and pack by size, age, gender, and season so donations can be easily prepared for resale. Gear up and pile up. Collect sufficient quantities of bags, boxes, and bins for packing up your donations. Then, pull every single thing out of closets, dressers, and storage bins and pile them all in the middle of a room. Be sure to include accessories: scarves, bags, belts, jewelry, and footwear, too. Set rules. For example, resolve to donate anything that is in relatively good condition, BUT: doesn’t fit, is out of style, has not been worn recently (or often), still has the tags on six months after purchase, or fails to flatter. Toss any garments that are: torn, stained, smelly, shabby, have been used for sleeping, swimming, or as undergarments. Purge ruthlessly (or recruit a friend to help). Instead of saving something for when you lose a few pounds, resolve to reward yourself with something new instead. If it’s too shabby to wear in public, it’s probably too shabby for working out in too. Heck, if you are going to be exercising and sweating, you deserve to look good doing it! Resist the urge to burden others with unsolicited hand-me-downs. If you know your frugal sister-in-law loves receiving your kids’ old clothes, go ahead and hand down. But never foist hand-me-downs on anyone who might be simply too polite to refuse. Re-store your keepers mindfully. Some ideas for organizing the clothes you keep are by: color, type of garment, season, frequency of wear, or whole coordinated outfits. Before putting everything away, check out different folding techniques and other tips we have for turning over closets that not only save space but make it easy to find things and make full use of your wardrobe. There’s nothing quite like the comfy feeling of plush carpeting under your toes in the morning. But, without regular surface and deep-cleaning, carpets can easily turn into incubators for all sorts of unwanted guests in your home. Before you get too worried, take heart that humans have been decorating their homes with carpets for multiple millennia and still the species flourishes. Be grateful for your hearty immune system and read on to learn why regular carpet cleaning is so important! 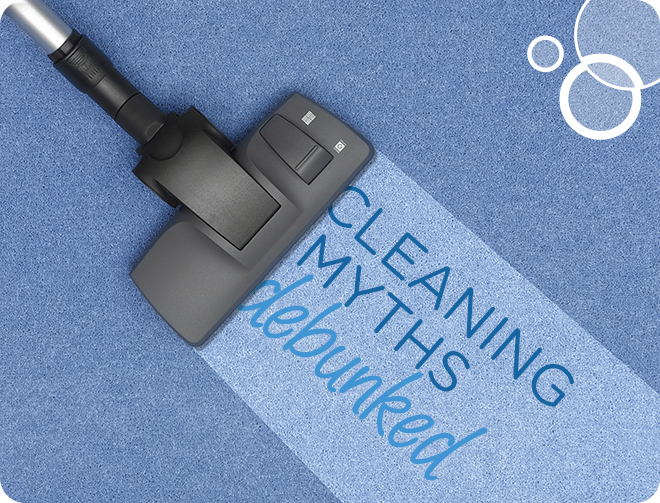 Myth #1 Your carpet is dirtier than a toilet seat! TRUE Typical carpet contains roughly 200,000 bacteria per square inch on average, making it technically 4,000 times germ-ier than a toilet seat. Most toilet seats are smooth, sealed surfaces that get cleaned and disinfected regularly, whereas many consumers wait years between professional carpet cleanings. Myth #2 Carpet can hide 1-lb of dirt per yard and still appear clean. TRUE This is where it get’s scary: those 200,000 bacteria per square inch feed on the millions of dead skin cells shed every hour by each person living in your home. Add in the daily tracks of living (pet dander, food crumbs, pollen, and soil off of the bottom of your shoes), and your carpet becomes a veritable Vegas Buffet for germs and bugs. Myth #3 2,000 dust mites can survive on a single ounce of carpet dust. TRUE While dust mites will gladly set up shop in mattresses and furniture, they are particularly fond of carpets due to their buffet of foods and the reasonably protected environment (you wash sheets regularly…carpets, not so much). If anyone in your home has a dust mite allergy, stick to hard-surface floors and washable area rugs as much as possible, especially in bedrooms where human dander is most prevalent. Myth #4 Norovirus can live for up to two weeks in carpet. TRUE This should be a death knell for the 5 Second Rule where food and carpets are concerned! Studies prove that norovirus can live for over 12 days in even regularly vacuumed carpeting. If your family seems particularly prone to stomach bugs, get carpets steam cleaned at a temperature of at least 158° F for five minutes or 212° F for one minute to completely kill off norovirus. Myth #5 Carpets filter air by trapping dirt, dust, and germs in their fibers. TRUE Carpeting is actually one of the most powerful natural air filters in your home, trapping dirt and germs from the air. Due to temperature differentials from inside to outside, homes actually breathe through the walls and roof. Carpeting acts as a huge, fluffy pre-filter, which is why the edges of carpets get dirty so fast even when you vacuum regularly. Myth #6 Vacuuming regularly is a sufficient way to cope with germs trapped in carpets. FALSE Even the most powerful vacuums struggle to extract dirt and germs from the base of carpet fibers. Moral of the story Make a habit of removing shoes when entering your home—or at least put down washable entry mats and runners and wash regularly. Invest in having carpets cleaned and extracted professionally at least once a year. In between professional cleaning and extraction, vacuum thoroughly at least once a week, using a high-quality machine with a motorized brush. You might also consider investing in a HEPA filtration type of vacuum—such as the ones used by our cleaning PROs. 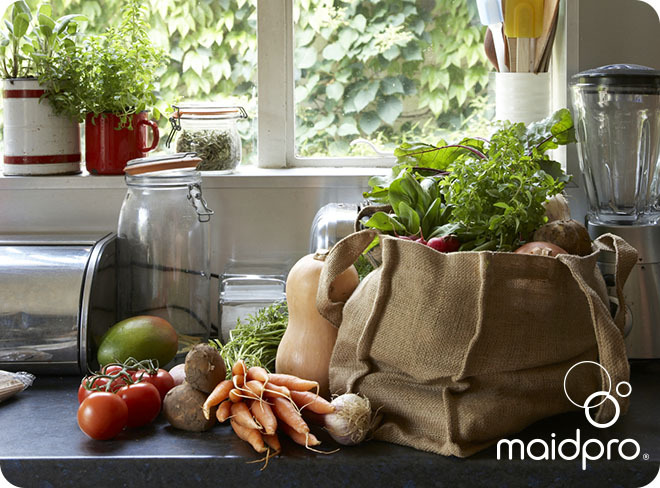 If you don’t want to be the one to do all that weekly vacuuming, remember MaidPro is always here to help! It’s a wild west out there. A surprising number of DIY beauty and skincare recipes contain potentially harmful ingredients (or concentrations thereof)—even when those ingredients seem perfectly innocuous. With DIY insect repellents, watch out for their use of essential oils. Not all essential oils are recommended for direct use on skin, especially with children or in high concentrations. Make sure to research usage recommendations and cautions for every ingredient on the list. Ingredient quality matters. 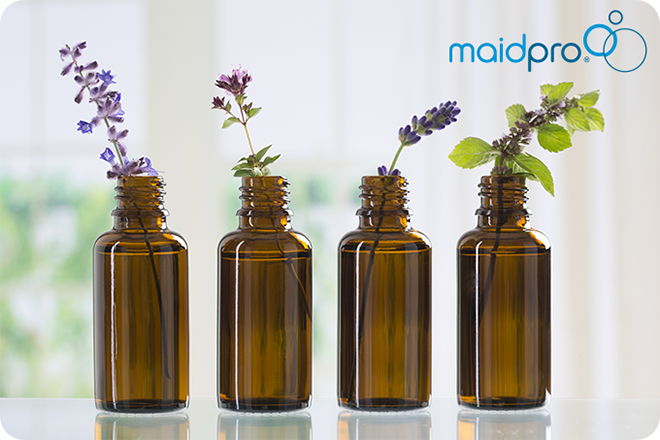 If using essential oils for the first time, there is also a great deal you need to learn about oil quality and purity. Where DIY insectifuge is concerned, there seems to be a consensus that greater oil purity equates to greater efficacy at repelling bugs, but there are still many conflicting opinions and plenty of misleading marketing language. That said, you’ll need to make your own judgement call about what brand to trust. If at first you don’t succeed, try other recipes! A DIY bug spray that works well for you might be 0% effective for a different person. Plenty of rigorous scientific studies prove that bugs are simply more attracted to some people over others. You might need to try an array of different DIY bug spray concoctions before hitting on a formula that works well for you and other members of your family. Some risks need to trump others. No bug spray—commercial or DIY—can be 100% effective at protecting against mosquito- and tick-borne illnesses. Physicians overwhelmingly recommend DEET-based varieties when knowingly going into areas where such diseases are most common.If you’re just one of those people for whom nothing—not even the DEET bug spray varieties—seems to work, you might resort toother natural methods of repelling bugs, sitting in a screened area, or simply heading inside when the bugs come out to feed at night! There are plenty of big, expensive projects you can undertake to make your home greener, such as insulating, adding water filtration, and retrofitting with energy-efficient heating/cooling systems and appliances. Here are 9 much less daunting things you can start any time—most of which will help you to save up for those bigger green home improvement projects. Don’t just turn off lights, appliances, and electronics, unplug them when not in use. That goes for all chargers, too, which continue to draw power any time they are plugged in. The drain from a single device or appliance might not seem too great, but when you multiply it across all the plug-in-able items in your home, you might be looking at hundreds of dollars in savings. Say “No!” to over-packaged and disposable consumer goods. Five easy swaps guaranteed to save you money are: concentrated for un-concentrated detergents; bar soap for body washes; refillable for disposable razors; cotton dish towels for paper towels; and linen for disposable napkins. The latter three have an added benefit of making your home more luxurious too. Keep oven and refrigerator doors closed when operating. Estimates vary but at least one says you can lose up to 150-degrees in just 30 seconds. Not only does it waste energy, it extends cooking time and contributes to poor results, such as dried-out meat or underdeveloped flavors. Check out your local farmers’ market. Okay, this one might be a little more expensive, but locally raised produce and meats have far lower environmental impacts and are generally more nutritious than those shipped from distant lands and stored for extended periods. Cut food waste by: shopping more frequently, checking to see what you have in stock before shopping, searching for recipes that use what you already have, and composting food scraps. By at least one estimate, a family of four can save more than $2K in a year. Get educated on how to minimize VOC air concentrations. A big part of living green is focusing on creating a healthy home environment for your family. Since it’s virtually impossible to avoid or remove all VOCs from the air, try cultivating some air-cleaning houseplants. Plant your yard and garden with native plants that thrive in local climate conditions. The reason: Native plants are already well adapted to the characteristics and typical variations in your climate (including, dry spells and heat waves, for example). This means they don’t need as much extra watering, feeding, and fertilizing as non-native plants do. They also support native ecosystems of birds, bees, insects, and other wildlife. Fix leaky faucets and toilets, which might be literally pouring money down the drain. According toisustainableearch.com, a leaky toilet can run you nearly $1K per year and can be very difficult to detect. If your water bill is high compared to your neighbors, check with your local DPW to see if they can help or provide a dye kit to help diagnose. Lower your thermostat by a few degrees (in winter). Turns out that, in addition to conserving energy and saving money, keeping even a slightly colder house can have plenty of other benefits, includingprolonging plants’ lives, boosting metabolism for weight loss, and sleeping better. Start with repair work. Inspect for and fix any winter wear and tear that could pose hazards of physical injury, such as splintering or rotting wood, loose or raised nails, cracks in cement, broken flagstones, and so forth. While you’re at it, inspect for—and be sure to clean out and seal—any places that might make ideal nesting spots for wasps, hornets, or other stinging pests. Get out the hose. Take advantage of lingering cooler days or early evenings for the more physically demanding work of sweeping, pulling weeds, and hosing down, scrubbing, or power-washing patios, decks, balconies, and outdoor furniture. If power-washing, be super careful to read and heed all safety instructions. Freshen the furniture. Especially if patio furniture winters outside, inspect carefully for signs of rust, rot, structural weakness, loose nails and screws, and address accordingly. Consider re-painting, re-staining, and/or treating for future resistance to rust. Check and treat all cushions, pillows, umbrellas, and other textiles for mold and mildew. Gear up your grilling game. If you have a gas grill, now is the time to fill propane tanks, clean, and inspect all gas lines and connections, and clean or replace lava stones. There two basic schools of thought on how to best clean grill grates, which we covered in this post a few years back. Decorate! The most enjoyable outdoor summer spaces borrow ideas from home decorating. For example, there is a whole world of amazing ideas just for decorating fences and outer walls. For inspiration with plants and flower pots, check out Southern Living’s 121 container gardening ideas. Consider also using containers to grow fresh veggies and herbs that you can harvest literally when our cooking on your grill. Talk about fresh! When it comes to placing flowering plants in or around patios, decks, and balconies, do some research first into what blooms and scents are most attractive to biting bugs and stinging creatures such as bees as well as to more welcome visitors such as butterflies and humming birds. Bear in mind as you decorate that mosquitoes breed rapidly in standing water, so, at all costs, avoid placing open containers that will collect rainwater. 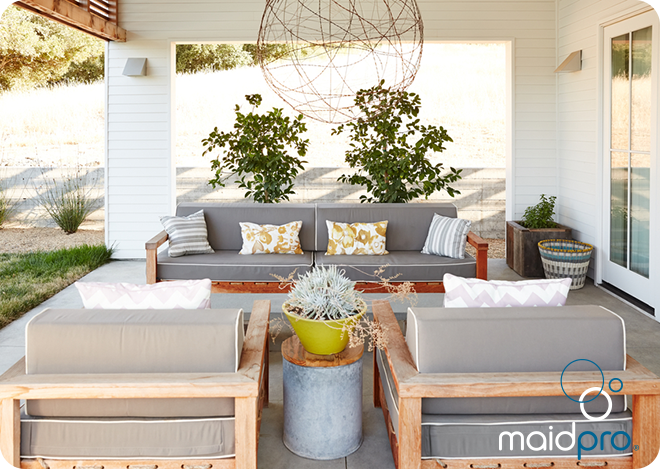 Other fun and practical elements to consider when decorating outdoor spaces for summer include: strings of white or colorful twinkling lights; paper lanterns; kerosene or solar-powered torches; a heating element such as a fire pit, propane heater, or chiminea for chilly nights; and lots of colorful pillows, cushions and even a blanket throw or two for max lounging comfort. Clean and/or replace home ventilation and air conditioning filters. If you’ve not done so at least once in the past year or two, it’s also a great time to bring in a pro service to inspect and clean all central HVAC equipment, ducts, vents, and air filters. Inspect for and address any signs of mold and mildew growth, which summer’s humidity will be sure to feed. Clean ceiling and portable fans. Note that most portable fans can be easily disassembled, enabling accumulated dust and grim to be washed from blades and grills. If you don’t have the proper tools—such as an extender pole – for cleaning ceiling fans safely, recruit at least one person to spot you on a ladder. Since you’ll have the ladder out anyway, remove and clean lighting fixture covers, recessed fixtures, and bulbs too to brighten up your space. Wash windows and clear away dead bugs and other debris that might have collected inside window casings over the winter and spring. Clean and inspect screens; patch holes. If you have an outdoor water source, window screens can be cleaned quickly and thoroughly with just a hose and sturdy rag to wipe away accumulated dirt and grime. Dry in the sun before installing. Clean blinds, curtains, window shades, and valances. Keeping blinds and curtains closed is a great way to keep your home cool and save on energy costs if you air condition. Since you’ll be seeing much more of them soon, it’s a great time to clean all window treatments and consider lightening up on fabrics and colors. Lighten the bedding. Think cotton in airy colors such as pure whites and pastels. While you’re at it, flip, rotate, and vacuum mattresses (which should be done at least twice a year) and dust thoroughly in and around beds to remove accumulated pollen and other spring detritus. Deep clean your fridge and defrost the freezer to maximize space for lots of fresh, light foods; stock your pantry with essentials for making salads, grilled specialties, and other cooling summer fare. Finally, if you expect to keep your windows mostly closed for A/C, consider freshening indoor air with a few new air-cleaning plants. In our next post, we’ll look at summer prep for patios, balconies, and other outdoor living spaces, so stay tuned! Myth: Mold & mildew are the same thing. Mildew is powdery or downy white, yellow, or brown-colored fungus that grows in a flat pattern on surfaces and can be scrubbed off easily with a spray cleaner and brush. Mold is a fuzzy, aggressively growing fungus that creates difficult-to- kill spore clusters that behave like roots and grow deep into porous surfaces such as drywall, tile grout, and wood. Mold can be blue, green, yellow, brown, gray, black, or white. In bathrooms, mold roots can travel all the way through grout, behind tiles, and into walls and house framing. Mold consumes and destroys surfaces and, depending on the variety, may also cause health problems, including sinus infections, headaches, allergies, inflamed respiratory airways, and more. Myth: Bleach kills 100% of mold and mildew. Bleach only kills mold and mildew on tops of surfaces. The chemical structure of bleach disallows its absorption into porous surfaces, no matter how much you apply, even when undiluted. The surface top may look clean and white, but just a few millimeters underneath the mold is still alive and will start re-growing within minutes. Myth: Once a surface looks clean and white, all mold has been removed. Bleach requires a full five-minute soak time with at least three-quarters of a cup of bleach per gallon of water to kill surface mold spores. The problem is that bleach makes mold look white before it dies, so people often rinse bleach away before it has killed any mold at all. Worse yet, the water in your bleach solution soaks into porous surfaces and feeds the deep mold you are trying to kill. Unchecked, the mold grows deeper into walls and studs until structural damage and health impacts become so bad the problem can no longer be ignored. 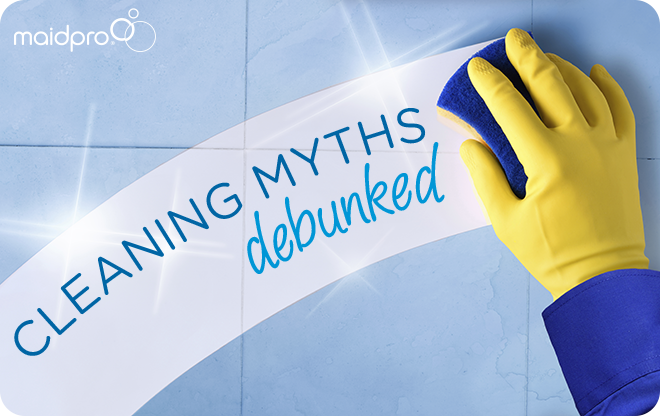 Myth: If grout looks good after cleaning with bleach, it was just mildew. This is a dangerous half truth and a big reason why so many home owners let mold damage get out of control in their bathrooms. There is a simple test: if you can scrub stains off easily with a bleach-free bathroom cleaner, it’s probably just mildew. If you use a bleach-based cleaner and the stains return after a few days in roughly the same spots, you’ve likely got mold growing beneath the surface. Myth: Once mold is dead, the problem is solved. This is, by far, the falsest claim of all. It is impossible to keep new mold spores from entering your home as it can grow anywhere it finds food—decaying matter such as fallen leaves, garbage, or trash—and moisture—which can be anything from leaky pipes to air humidity—in temperatures ranging from 32-120°F. Even mold on food in your freezer doesn’t die; it merely goes dormant until it warms up! If you can survive in an environment, so too can mold. What is more, there are varieties of mold spores that are just as toxic and allergy-inducing when dead as when they are alive and growing. Myth: Homeowners can easily solve mold problems on their own. The only way to truly solve a mold problem is by removing infected materials and the sources of moisture that started the problem. Controlling indoor air humidity, repairing leaky pipes and shower walls, resealing and replacing porous grout, caulking, and more are all parts of the solution. Most mold sprays are simply fancy-marketed bleach sprays that remove mold stains, but do nothing to address root problems. As a rule of thumb, if you have a mold-affected area larger than 10 square feet, immediately seek the help of a professional mold-abatement service. 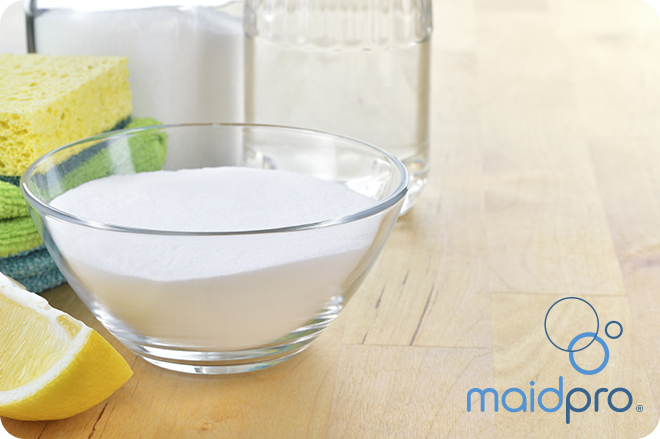 MaidPro House Cleaning from MaidPro NJ/DE on Vimeo. Like Us. Win Free Cleaning!